Howdy! So we’ve been using Dr. Greger’s Daily Dozen app this past week. Renee and I have been using it every day, we love it. The app is great, it’s easy to use. Like I say in the video here it’s the best app I’ve ever found. You don’t have to track calories, or type in what you eat all day. Who wants to do that? Not us. Each time you eat something it’s two taps to log it. The app does the rest. The beauty of this app is how simple it is. One thing Renee and I have always talked about since we started our plant based journey is, “Are we getting all the nutrients we need?”. Of course we never asked ourselves this when we were eating meat and dairy! But now that we’re running on high octane premium, we want to be sure we’re getting all the power we can. Using this app, it’s easy for us to track what we eat and what we need to eat. So here’s an example of breakfast. I’m up to 30% of my daily dozen! Of course this is just one example. 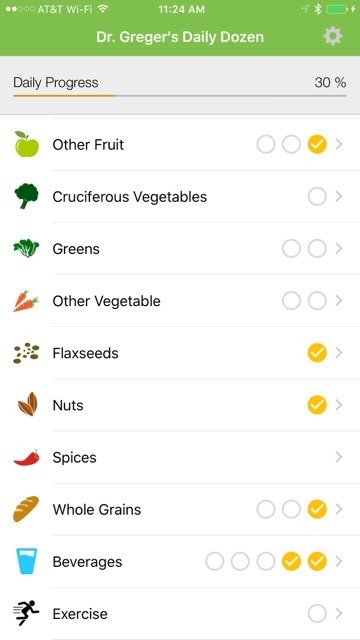 The Daily Dozen app gives you different ideas for foods to each in each category.